In recent weeks, Google has been the target of several lawsuits – one from the Association of American Publishers as well as a class-action lawsuit from the Authors Guild. In this article we will take a look at exactly how the Google Print project is being implemented and why publishers and authors would be so angry with them. For some time now Google has been scanning books – both copyrighted and public domain – from major libraries around the country and pouring this content into an index-searchable database. 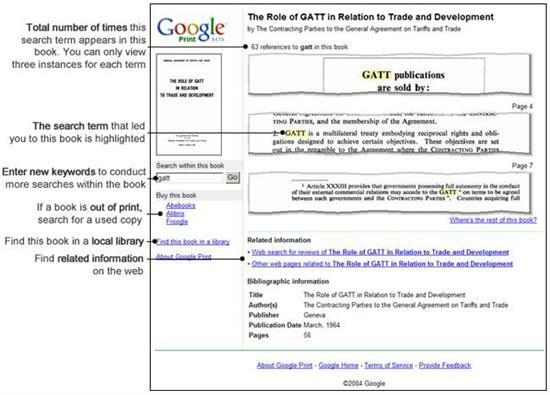 What is different about the Google project – from say Project Gutenberg – is that Google is scanning copyrighted books in many cases, without permission from the publishers or copyright holders. Google has also signed deals with a number of major publishers to receive books in digital form. Users of the Google Print website, and recently the main web search engine, will receive search results from within books. In the case of unlicensed copyrighted books, users will only be able to see the title and general citation information as well as a very limited area around their search terms from within the book. So why are publishers and authors so mad about this? First and foremost, Google Print represents, in many ways, a challenge to the existing order. Authors write books, publishers print, distribute and sell books, and that is the whole story. Intellectual property laws allow said authors and publishers to control the exact distribution of their content and its exact pricing. Google’s approach of scanning these books without permission is tantamount to a high-profile slap in the face. Google is now distributing their content directly to the end user, even if in an abbreviated form, and thus diminishing the power of the existing order. It could be argued that over time, search engines could become a crucial avenue for book advertising and that Google could eventually charge publishers to list their books on Google Print.